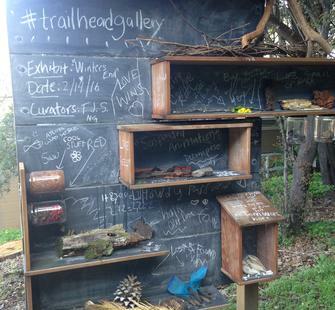 Fieldworks Collaborative (Trena Noval and Ann Wettrich) invites casual walkers, hikers and nature enthusiasts who frequent Montalvo’s woodlands to assemble, curate and share objects of wonder discovered along hiking pathways. Newly installed at the head of a woodlands trail near Montalvo's historic Belvedere Temple, you will find this redwood station with display shelves, as well as nooks and collection jars for documenting discoveries and displaying objects of interest. Chalkboard backdrops and supplies at the site offer the opportunity for adding context, labels, notations and comments.